In the spring of 1777, British forces reinforced with Hessian troops were stationed in New Brunswick, New Jersey and conducted foraging raids against local targets in the area with little success. General George Washington at this time held the Continental Army north near Morristown. 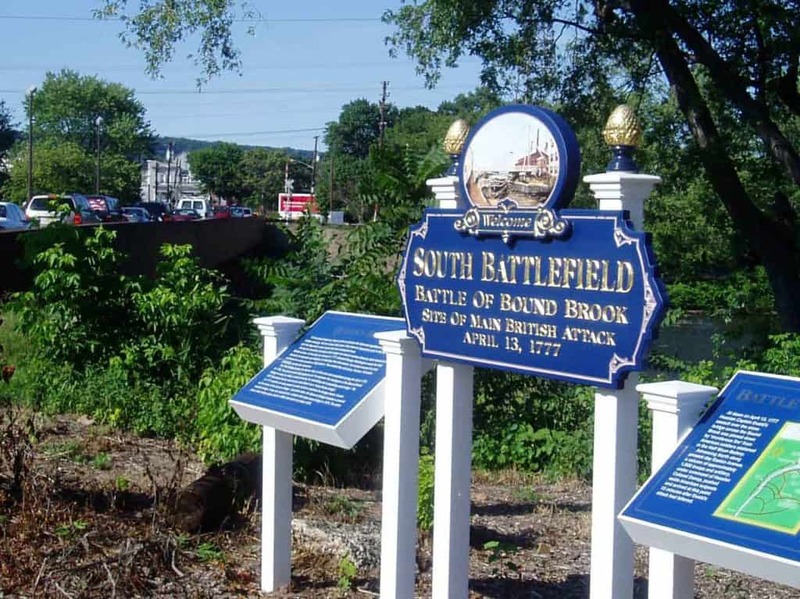 His southern outpost on the Raritan River, and closest to the 17,000 British troops, was his outpost garrison of about 500 men at Bound Brook, under the command of Major General Benjamin Lincoln. 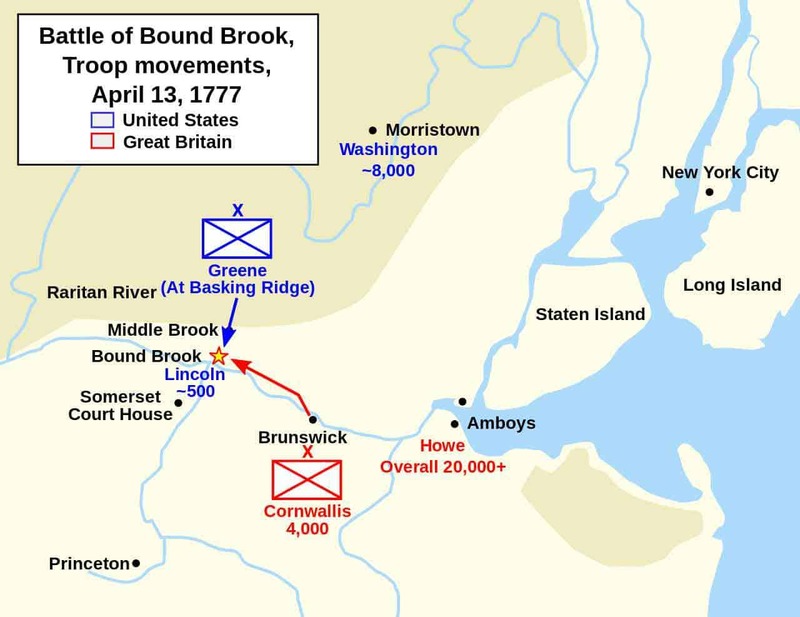 As the foraging strategy did not prove to be successful, General William Howe and Lieutenant General Charles Cornwallis decided to make a surprise attack on the American outpost at Bound Brook. The objective of capturing the entire garrison was not met, although prisoners were taken. Lincoln, left in great haste, abandoning papers and personal effects. On April 12, late on the evening, about 4,000 British and Hessian troops, under the command of Cornwallis marched from the British stronghold of New Brunswick. All but one detachment reached positions surrounding the outpost before the battle began near daybreak the next morning. During the battle, most of the 500-man garrison escaped by the unblocked route. American reinforcements arrived in the afternoon, but not before the British plundered the outpost and began the return march to New Brunswick. Armies - American Forces was commanded by Maj. Gen. Benjamin Lincoln and consisted of about 500 Soldiers. British Forces was commanded by Gen. Charles Cornwallis and consisted of about 4,000 Soldiers. Casualties - American casualties were estimated to be about 40 killed, 30 wounded, and 80-90 captured. British casualties were 1 killed and 7 wounded. Following the battles of Trenton and Princeton, the Continental Army of Washington entered winter quarters in Morristown, New Jersey, while the British and German forces of Howe settled into winter quarters in New York City and northeastern New Jersey. Throughout the winter months, a guerrilla war of sorts went on, in which American militia companies, sometimes with Continental Army support, harassed British and German outposts and ambushed their foraging and raiding expeditions. One of the forward bases used for these operations was at Bound Brook, located on the Raritan River upriver from New Brunswick, the major British camp in New Jersey. 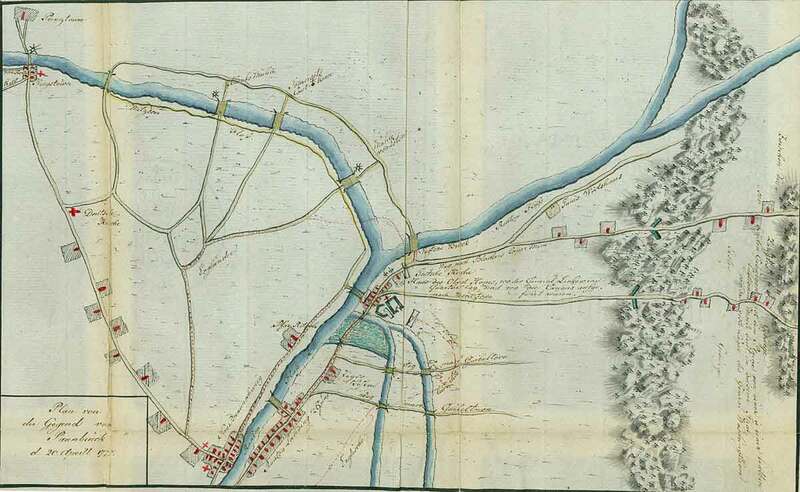 The post was responsible for patrolling three bridges across the Raritan, likely to be used by the British in moves against the main camp at Morristown. In February 1777, the Bound Brook outpost consisted of 1,000 men under the command of Lincoln, but this was reduced by expiring militia enlistments to 500 in mid-March. The troops that remained were from the 8th Pennsylvania Regiment, a company from the 4th Continental Artillery, and two independent companies from the Wyoming Valley in what is now northeastern Pennsylvania, but was then also claimed by Connecticut as Westmoreland County. Lincoln expressed concern over his exposed position to Washington, noting that many units were not in a position to "render the least assistance to this post in case it is attacked", and that he was keeping wagons ready in case a precipitate departure was needed. Cornwallis, in command of the British forces in New Jersey, had had enough of the ongoing guerrilla war, and organized a reprisal action against the Bound Brook outpost. Cornwallis asked Captain Johann Ewald to draft a plan of attack in February, but the plan could not be executed until springtime because it necessitated fording the Raritan River. On April 13, under the command of Cornwallis, about 4,000 British and Hessian troops were used in a 4-pronged surprise attack against the American garrison at Bound Brook. Two groups moved north along both sides of the Raritan River, while a third contingent crossed the river further up to attack from the West, and the fourth group moved from the East to cut the potential retreat route of the Americans. The vanguard of Hessian Field Jaeger Corps, under Colonel Johann Ewald, encountered at first fierce resistance from the Americans on the left bank of the Raritan river. Shortly thereafter, the main contingent of the British army crossed the Queen’s Bridge to the left side and entered Bound Brook. The American forces were caught be surprise and fled fighting during their retreat. Lincoln barely escaped and “did not collect his clothes”. The fourth column of the British coming from the East along the Watchung mountains arrived late. The British captured also cannons, ammunition, supplies, and Lincoln's papers looted in Bound Brook, but returned the same day to New Brunswick. In the evening, the Continental Army, under Major General Nathanael Greene, occupied Bound Brook again. 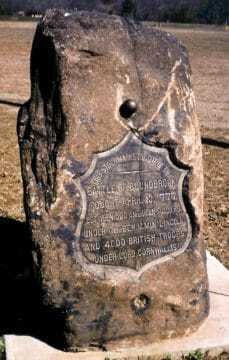 While the Continental Army was caught by surprise by an overwhelming force, the British did not press their advantage and returned to New Brunswick. Thus, it was a shallow victory. Washington recognized that Bound Brook itself was a difficult place to defend. A local farmer was suspected of having learned the password and giving it to the British. The militia were blamed for the surprise attack. They were supposed to be guarding the river, which could be crossed at just about any place. This incident caused Washington to reduce the number of his detached posts to prevent their being destroyed by other British surprise attacks. This decision also was able to let him quickly gather his troops when the British started their expected spring offensive. The Continental Army response was immediate; Washington sent a large force under Greene to reoccupy Bound Brook. The British had already left by the time they arrived; Greene sent a detachment to harass their rear guard. This detachment caught up with the British near Raritan Landing. Washington, concerned that the attack presaged an early start to the campaign season, worried that his troops were not yet in place to deal with major British movements. Two weeks later, after no further major activity, the Americans learned that "the Enemy are to take the field the first of June." 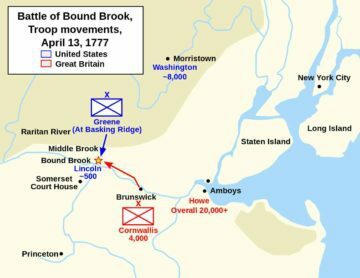 On May 26, Washington withdrew the American garrison because he recognized that Bound Brook itself was a difficult place to defend. On May 28, he moved part of his army from Morristown to a new entrenched camp near Middle Brook, just north of Bound Brook but well protected between the first and second Watchung Mountain ranges; other troops were stationed near Princeton. From the top of the Watchung Mountains Washington monitored British movements while the two sides continued to skirmish. Both sides also engaged in intelligence gathering, each trying to determine the strength and intentions of the other. On June 12, Howe marched a significant force (more than 18,000 men) out of New Brunswick, through Bound Brook, and as far as Somerset, apparently in an attempt to draw Washington out of the hills. Washington, aware that Howe had left the army's heavy baggage behind, was not fooled and refused to move. On June 19, Howe abruptly retreated back to Piscataway, upon which Washington had some of his troops give chase, and he moved down out of the hills. A week later Howe tried to spring a trap on one of Washington's detachments that would have cut the American retreat into the hills off; this effort was repulsed in the Battle of Short Hills. After this failure, Howe embarked his army on transports and set sail for Chesapeake Bay, intending to take Philadelphia from the south.